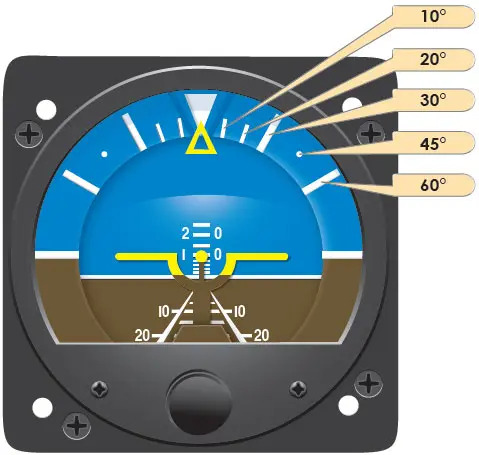 The first attitude instrument (AI) was originally referred to as an artificial horizon, later as a gyro horizon; now it is more properly called an attitude indicator. Its operating mechanism is a small brass wheel with a vertical spin axis, spun at a high speed by either a stream of air impinging on buckets cut into its periphery, or by an electric motor. The gyro is mounted in a double gimbal, which allows the aircraft to pitch and roll about the gyro as it remains fixed in space. Figure 5-30. The dial of this attitude indicator has reference lines to show pitch and roll. A small symbolic aircraft is mounted in the instrument case so it appears to be flying relative to the horizon. A knob at the bottom center of the instrument case raises or lowers the aircraft to compensate for pitch trim changes as the airspeed changes. The width of the wings of the symbolic aircraft and the dot in the center of the wings represent a pitch change of approximately 2°. For an AI to function properly, the gyro must remain vertically upright while the aircraft rolls and pitches around it. The bearings in these instruments have a minimum of friction; however, even this small amount places a restraint on the gyro producing precession and causing the gyro to tilt. To minimize this tilting, an erection mechanism inside the instrument case applies a force any time the gyro tilts from its vertical position. This force acts in such a way to return the spinning wheel to its upright position. The older artificial horizons were limited in the amount of pitch or roll they could tolerate, normally about 60° in pitch and 100° in roll. After either of these limits was exceeded, the gyro housing contacted the gimbals, applying such a precessing force that the gyro tumbled. Because of this limitation, these instruments had a caging mechanism that locked the gyro in its vertical position during any maneuvers that exceeded the instrument limits. Newer instruments do not have these restrictive tumble limits; therefore, they do not have a caging mechanism. When an aircraft engine is first started and pneumatic or electric power is supplied to the instruments, the gyro is not erect. A self-erecting mechanism inside the instrument actuated by the force of gravity applies a precessing force, causing the gyro to rise to its vertical position. This erection can take as long as 5 minutes, but is normally done within 2 to 3 minutes. Attitude indicators are free from most errors, but depending upon the speed with which the erection system functions, there may be a slight nose-up indication during a rapid acceleration and a nose-down indication during a rapid deceleration. There is also a possibility of a small bank angle and pitch error after a 180° turn. These inherent errors are small and correct themselves within a minute or so after returning to straight-and-level flight. A magnetic compass is a dependable instrument used as a backup instrument. Although very reliable, it has so many inherent errors that it has been supplemented with gyroscopic heading indicators. The gyro in a heading indicator is mounted in a double gimbal, as in an attitude indicator, but its spin axis is horizontal permitting sensing of rotation about the vertical axis of the aircraft. Gyro heading indicators, with the exception of slaved gyro indicators, are not north seeking, therefore they must be manually set to the appropriate heading by referring to a magnetic compass. Rigidity causes them to maintain this heading indication, without the oscillation and other errors inherent in a magnetic compass. Older directional gyros use a drum-like card marked in the same way as the magnetic compass card. The gyro and the card remain rigid inside the case with the pilot viewing the card from the back. 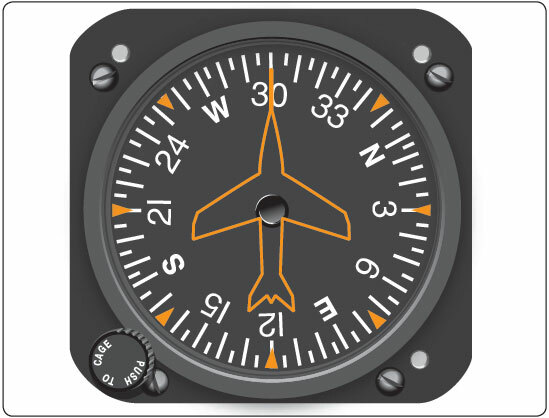 This creates the possibility the pilot might start a turn in the wrong direction similar to using a magnetic compass. A knob on the front of the instrument, below the dial, can be pushed in to engage the gimbals. This locks the gimbals allowing the pilot to rotate the gyro and card until the number opposite the lubber line agrees with the magnetic compass. When the knob is pulled out, the gyro remains rigid and the aircraft is free to turn around the card. Directional gyros are almost all air-driven by evacuating the case and allowing filtered air to flow into the case and out through a nozzle, blowing against buckets cut in the periphery of the wheel. The Earth constantly rotates at 15° per hour while the gyro is maintaining a position relative to space, thus causing an apparent drift in the displayed heading of 15° per hour. When using these instruments, it is standard practice to compare the heading indicated on the directional gyro with the magnetic compass at least every 15 minutes and to reset the heading as necessary to agree with the magnetic compass. Heading indicators like the one in Figure 5-31 work on the same principle as the older horizontal card indicators, except that the gyro drives a vertical dial that looks much like the dial of a vertical card magnetic compass. The heading of the aircraft is shown against the nose of the symbolic aircraft on the instrument glass, which serves as the lubber line. A knob in the front of the instrument may be pushed in and turned to rotate the gyro and dial. The knob is spring loaded so it disengages from the gimbals as soon as it is released. This instrument should be checked about every 15 minutes to see if it agrees with the magnetic compass. Figure 5-31. The heading indicator is not north seeking, but must be set periodically (about every 15 minutes) to agree with the magnetic compass.